Summary on the Irish Brandubh. The attackers can be set up in three ways, here called cross, circle and line. 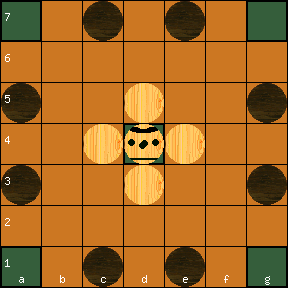 To that comes that the board can contain a throne square or not. The game with a throne will be called Brandubh, and the game with no throne will be called "Brandubh throneless". 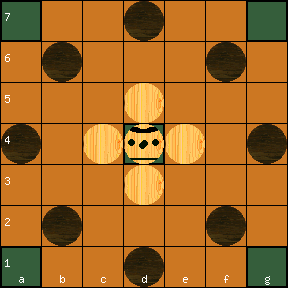 This makes in all 6 possible initial setups for the Brandubh 7x7 game. In any case the Brandubh king is armed, is captured from two sides and wins in corner. 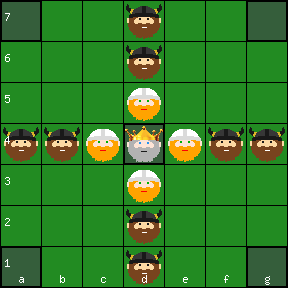 The measured game balances confirm, that a throne square protects the king and is a help to the defenders. The best balanced setup was found to be Brandubh cross. 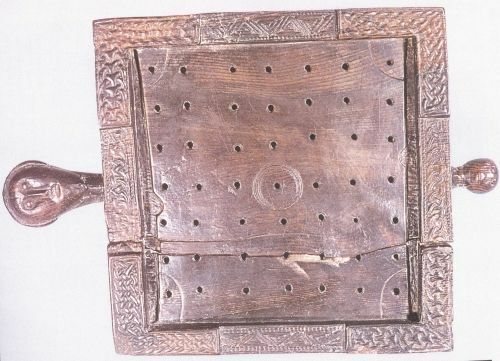 As for historical evidence, the Ballinderry board has marked corner squares and a marked throne. 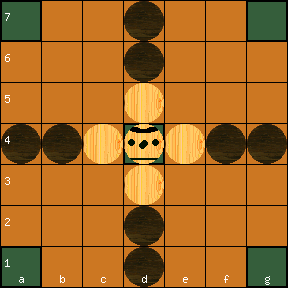 Our test games show that the Brandubh cross setup fits this board. More about the Irish Brandubh in our forum.